The media tablet market has apparently matured. 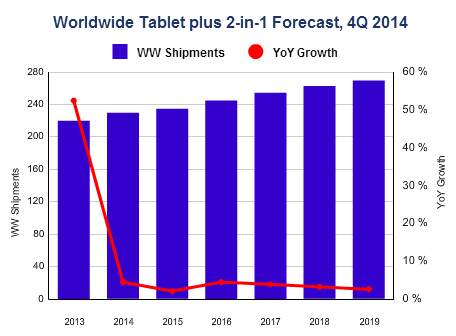 Following the first year-over-year decline in worldwide media tablet shipments in the fourth quarter of 2014 (4Q14), International Data Corporation (IDC) has scaled back its five year forecast for the product category. That being said, the market outlook is still somewhat promising. Worldwide shipments are now expected to reach 234.5 million units in 2015 -- that's a modest year-over-year increase of 2.1 percent from 2014. Although the outlook has been tempered, IDC expects positive growth for the market in the years to come as demand in the commercial sector increases -- particularly as more enterprise mobility applications gain adoption and improve user productivity in meaningful an substantive ways. "Despite the growing popularity of phablets, there still remains a portion of the market that wants to use a larger device so they can tailor their experience to the appropriate screen size," said Jitesh Ubrani, senior research analyst at IDC. Meanwhile, IDC belives that an increasing number of vendors behind small tablets are reducing prices and adopting features like voice calling to entice consumers to purchase their products over competing phablets, making the dynamics of phablets vs voice-capable tablets an interesting one to watch. In terms of platforms, Google Android will remain the leader, with close to two-thirds of the market over the course of the forecast period. Once-upon-a-time-leader Apple iOS is likely the weakest link as IDC expects its volume share of the market to decline in 2015, reaching levels below that of the past three years. Microsoft Windows, despite modest adoption to date, is expected to gain significant share over the course of the forecast period, growing from 5.1 percent in 2014 to 14.1 percent in 2019. "Microsoft is doing a lot of good things right now and we believe the launch of Windows 10 later this year will not only have a significant impact on Microsoft's share of the market, but on the industry as a whole," said Jean Philippe Bouchard, research director at IDC. There is an appetite for a platform that can provide a productivity experience that remains consistent across multiple form factors and device types, and IDC believes that Microsoft is well positioned to capture some of that demand. We'll have to wait and see -- time will tell if Microsoft can attract enough developers to its business tablet app ecosystem.